If you have a large number of websites or you are unable to use any of the verification methods listed, contact us on support@netsparker.com so that we can whitelist your account. You need to have access to the website for this verification method. For further information, see Adding a Website in Netsparker Enterprise and Importing Websites in Netsparker Enterprise. From the main menu, click Websites, then Manage Websites. Next to the relevant website, click Edit. The Edit Website window is displayed. Click Verify. The Verify Ownership window is displayed. By default, the File Upload method is displayed. Click Download your verification file. The Save dialog is displayed. Select a Save location, then upload it to the root folder of your website. Click Verify that is correctly set up to see if the file has been uploaded correctly. The URL field in the Edit Website window displays a green Verified button, and you are authorized to scan that website. Select the Alternate Methods tab. Copy the meta tag text from the field and paste it into the <head> tags in the website's home page. The URL field in the Edit Website window displays a green Verified button, meaning you are now authorized to scan that website. 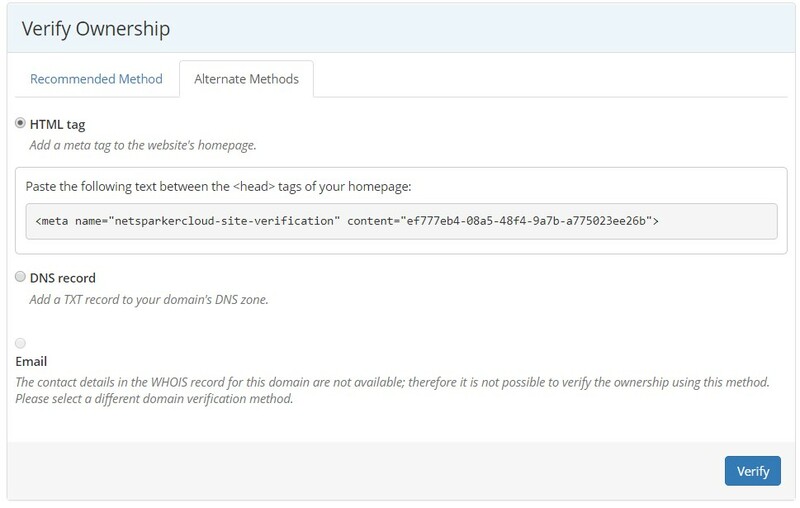 To use this DNS verification method you need to be able to add a new record to the domain's DNS zone. Add a new TXT record in your domain's zone. 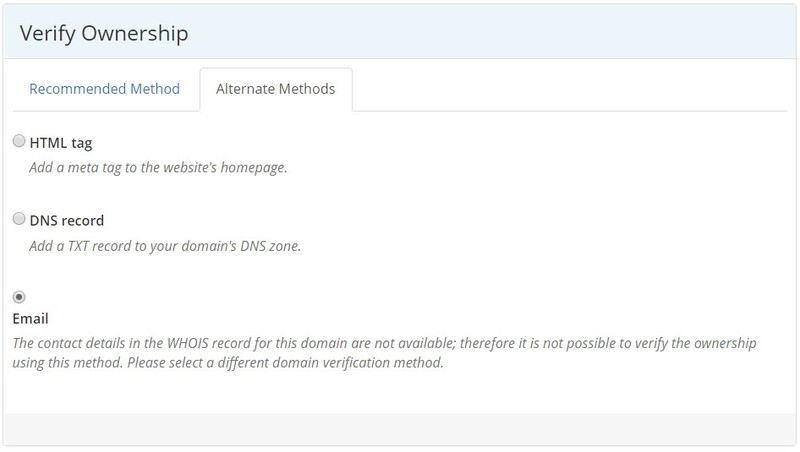 The Domain Name and Record (value) for the new TXT DNS record are specified in the verification step. 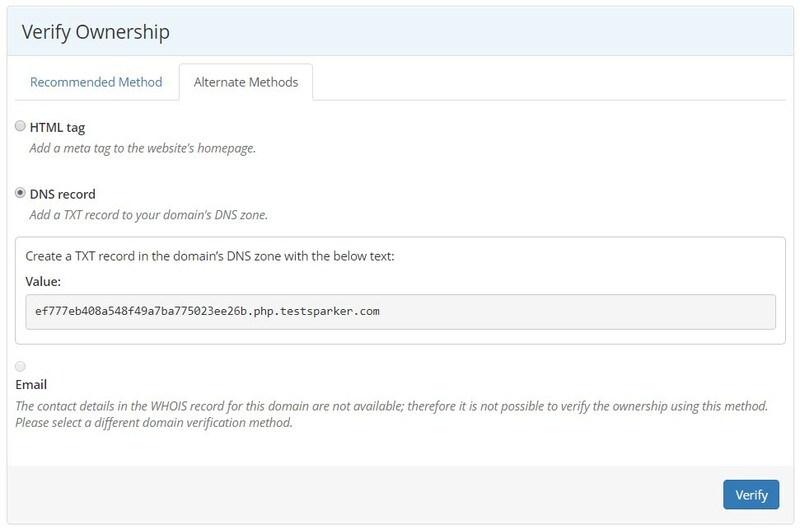 If your Netsparker account is already configured to verify by email (there is an email address listed in the domain's WHOIS entry), you will receive a prompt to do so, when you add a website. (Alternatively, you can select another method at this point.) If not, you can follow these instructions. Netsparker Enterprise sends an email containing a verification link to the email address listed in the domain's WHOIS entry. Once the verification link is clicked, the URL field in the Edit Website window displays a green Verified button, and you are authorized to scan that website.